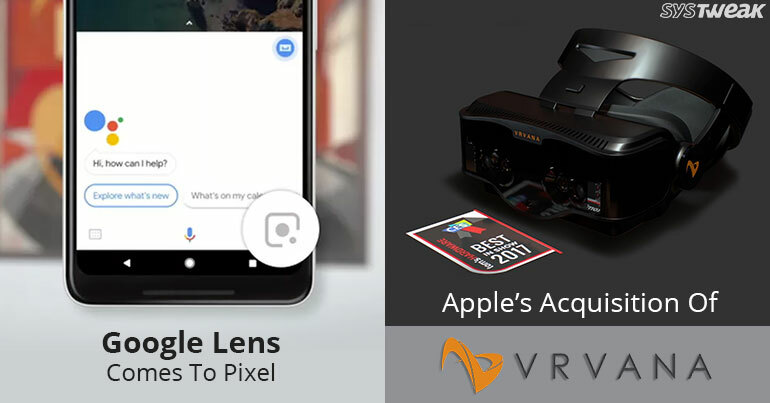 NEWSLETTER: Google Lens Will Be Part Of Google Assistant on Pixel & Is Apple Pivoted Towards AR? Finally, Google Lens is arriving on Google Pixel. WASN’T IT ALREADY IN PLAN? After the developer conference, it was clear that Google Lens would be a part of Google Assistant on Pixel phones soon. However, the timings were uncertain. With the latest update, it was confirmed that Google is all set to roll out in coming weeks. Google also informed that the feature will roll out slowly, at first it would be coming to Pixel phones in the US, UK, Canada, Australia, Singapore, and India. As the feature goes live, you will see the Google Lens logo at the bottom-right end of the Google Assistant screen. To the present time, the only medium to access Google Lens on Pixel phone was Google Photos. The process was too complicated then, as you had to take an image first, then you have to go to Google Photos to access the image and tap the Lens icon. However, with this update rolling out, Google Lens would be placed on the Assistant screen at the bottom right corner. Google informed about the things that Google Lens would do. It can save information from business cards, follow the URLs, recognize places and objects, show info about the movies by focusing the camera lens at the poster. Moreover, it is also capable of scanning barcodes. Rest would be known once the update is live. With Google Lens, Google Assistant would become smarter than ever. It would be one of a kind as conventional digital assistants have ears, but Google Assistant would have eyes too. DOES APPLE’S NEW ACQUISITION POINTS TOWARDS AN AR FUTURE? It is said that Apple has taken over Montreal- based 12-year-old startup, Vrvana. WHY APPLE ACQUIRED AN AR COMPANY? Apple acquired Montreal-based startup Vrvana a 12-year-old company. The purpose of Apple behind the acquisition is producing hardware for augmented reality and virtual reality experiences. The deal was said to be finalized for around $30 million. Vrvana is the company which got great reviews for its unreleased product, Totem headset. It is a device which uses both augmented reality and virtual reality to enable a user to get both the experiences on a single headset. Totem is different from other AR/VR headset in the market as it has the ability to overlay fully opaque, true color animation world on top of the real world which makes it look more real. This gives an advantage to Totem as it can “seamless blend” between VR and AR environments. A new and different approach of Vrvana piqued Apple’s interest, therefore Apple ended up buying the company. Apple has aimed to ship an augmented reality headset by 2020. Apple is working hard for it and it seems to be intelligent step to acquire Vrvana the business perspective, given the popularity it had gained with the unreleased headset, Totem. With the release of iPhone 8, the world has come to know that Apple is pivoted towards AR as Apple flaunted the phones as natively designed for augmented reality. The new iPhones have Apple’s ARkit SDK, which is just a start, an exclusive hardware would definitely expedite the process. Until now, Apple has always put stress on making the software better, ARkit and better camera arrays are the examples of it. However, with the recent acquisitions, it has been proved that the attention of Apple has shifted to developing technology that powers hardware. All we need to do is, wait for the Apple-powered headset to see the end results.